When my Boss told me a few months ago to “Go and interview them,” I could not believe it. “Are you serious?” I replied. “You want me to interview those…” But she had already looked away, bored. Go and interview them: that is all I had to do. Who was I supposed to interview? The umpteenth interview with an astronaut? Samantha Cristoforetti? A flight controller at Columbus-Control Centre? An interview with Stefano Polato or Filippo Ongaro? Nah. Why the silence and the sceptical look? Dear fruit flies, the interviewer should be the one to ask the first question, not you. Don’t you think? Yes but you have been staring at us for the last fifteen minutes. Don’t you think we do have something better to do seeing as we only live for a couple of weeks? Look, let’s start with the questions please, we only have five minutes before our interview with the BBC, CNN and Rai news. We do hope they sent someone a bit brighter. Go, come on, hurry up! So: you are just fruit flies, little limp creatures, and as your name implies, rather insignificant. You buzz around fruit, you leave larvae behind, and you ruin the fruit for the rest of us. As far as I know only mosquitoes are worse than you. So I ask myself: why would anyone want you on the Space Station? We definitely set off on the wrong foot here! For a start, we have already participated in various missions on NASA’s Space Shuttles and our scientific name is Drosophila melanogaster. What’s your name? There you go, just appreciate the difference! Drosophila melanogaster: sounds a bit better, right? A tad more noble, n’est-ce pas?. And if you were not so ignorant, you would know that for years we provide invaluable knowledge to the humans that study us. In fact, we are very renowned fruit flies in research and considered a “model organism”. And what does a “model organism” mean? It means that we are easy to breed, we reproduce in larger quantities than rabbits, our DNA has been known for over 20 years, we have only four pairs of chromosomes and, as if that is not enough, our genetic code is similar to human’s, especially with regard to the transmission of diseases. Approximately 77% of the genes carrying diseases in humans have an analogue in our genome: Parkinson’s disease, Alzheimer’s and so on. Then it means you are useless since we already know about these diseases in humans, what is your purpose? Look, try switching on your brain, please. Scientists know about the genetic diseases of humans, but it is difficult to study the genetic transmission of a disease as it spans the lifetime of a human being, around 70-80 years. We reproduce very fast: our life spans a couple of your weeks and each female lays around 600 eggs. Get where we are going? Our genome is transmitted in real-time, “live” in front of scientists eyes, to many descendants. From your reaction it seems as though you still do not get it, do you? But how many are going to space? We start with a little more than 100. It is the mechanism of genetic transmission that interests scientists, understand? And we show it to them, generation after generation. But why on the International Space Station? Because there is no gravity up there. And gravity could be an important part of genetic transmission. Our scientists have created a beautiful experiment! Tell me more … how does it work? The Fruit Lab System has three components: a small housing compartment in which we launch. A second compartment is where we live and get fed and where our larvae are extracted. 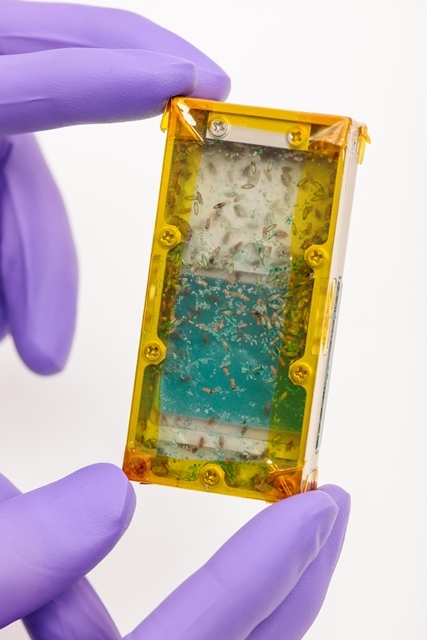 What do the astronauts do with your larvae? Do they eat them? Are you fresh food? What??? Where do you come from? The larvae are stored in a refrigerator called MELFI where our offspring are preserved and brought back to Earth for further study. There is a third housing compartment, where we can fly freely, assuming we are not affected by weightlessness too much. Here scientists mounted a camera to watch us 24 hours a day. A sort of Big Brother for fruit flies. A number of us live in weightlessness while others live in a small centrifuge to simulate Earth’s gravity. The larvae we produce are frozen, brought back to earth and studied. Are you really convinced that something interesting for mankind may come out of this? Of course, this is what we aim for and the scientists whom we are trying to help. We have been helping humans to understand how their bodies function for over a century!